The past week has seen an epic, historic struggle on the Senate floor over the line between the surveillance state and Americans' 4th Amendment rights. Senator Rand Paul and a handful of reform-minded colleagues from both parties are continuing to block any effort to let the government mass surveillance authorities be renewed without strong protections for Americans' right to due process. Section 215 of the USA PATRIOT Act, which has been used to justify the mass collection of data on millions of Americans, is set to expire on midnight on Sunday, May 31st. In spite of the abuse of this authority revealed by NSA whistleblowers, and in spite of the fact that the intelligence committee admits that bulk collection of data is of limited usefulness, surveillance advocates in the Senate have tried to insist upon just reauthorizing Section 215 without any reform. Thus far, the best attempt at reform that Senate Majority Leader Mitch McConnell will even allow on the floor is the USA Freedom Act, a well-intentioned bill that nevertheless falls well short of being a full protection against warrantless government surveillance. Although the USA Freedom Act passed the House, 60 representatives, led by Congressmen Justin Amash (R-MI) and John Lewis (D-GA) sent a letter to the Senate, urging that chamber to address the severe shortcomings in the bill. All Senator Paul has been asking for, and FreedomWorks along with him, is that Senator McConnell allow votes on amendments to strengthen the USA Freedom Act. But McConnell, who does not support even the USA Freedom Act's limited reforms, refused. Thus, Senator Paul has, via his standing filibuster last week and by employing parliamentary obstructions, delayed any votes so that even if the Senate passes a clean reauthorization of Section 215 for any length of time, the House has already left town and cannot pass it in time to prevent the section from expiring. Senator Mike Lee, the lead sponsor of the USA Freedom Act, even joined Senator Paul's filibuster last week to ask that the Senate simply be allowed to have a more open debate whether and how the bill could be improved. 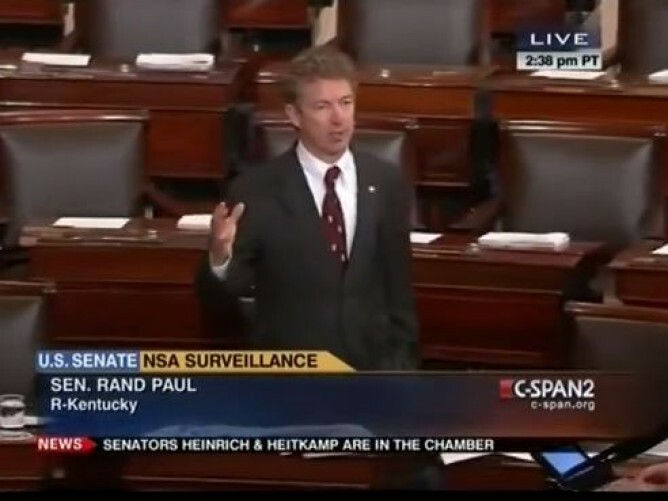 When the Senate failed to pass either the USA Freedom Act or a two-month reauthorization of Section 215 early Saturday morning, Senator Paul made a simple ask - that two of his amendments to the USA Freedom Act be allowed votes, with a simple majority threshold (51 votes) for passage. The Senate will return to town on the afternoon of May 31st in order to have one last debate before Section 215 sunsets. If McConnell continues to refuse any semblance of an open process to amend and improve privacy protections for innocent Americans, the the NSA's unlimited data dragnet should simply be allowed to expire. As McConnell said himself just last year, regarding the 2nd Amendment, "The Bill of Rights does not come a-la-carte. It is not a pick-and-choose menu..." It's time to hold McConnell and his pro-surveillance colleagues to that same standard with regard to the 4th Amendment.